NOTE: A big thanks to Bob Brown for the information he provided regarding Thomas' apprenticeship, move to Taree and death. 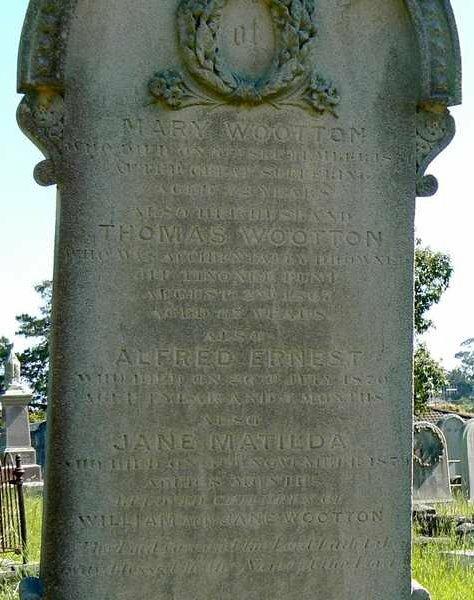 Thomas Wootton was born 12 May 1799 in Hamsworth, Staffordshire, England and died 01 Aug 1867 in Taree, NSW, Australia. He was the son of William Wootton and Mary Wright. He married Mary O'Donnell 02 Apr 1840 in Port Macquarie, NSW, Australia. On the 12th Mary, 1815 he was apprenticed to Matthew Robinson Boulton and James Watt Jr. The following is from the Boulton & Watt Collection at the Birmingham Public Library, UK. "This indenture witnesseth that Thomas Wootton, son of William Wootton of the Parish of Handsworth and County of Stafford, by and with the consent of the said William Wootton his Father testifyed by his being a party to and signing and sealing these presents doth put himself apprentice to Matthew Robinson Boulton and James Watt Junior of Soho in the Parish of Handsworth and County of Stafford, Engineers and co-partners to learn their Arts and with them after the manner of an apprentice to serve from the day of the date of these presents for during and unto the full end and term of five years from hence next ensuing, and fully to be complete and end during which term the said Apprentice his said Master faithfully shall serve their secrets keep their lawful commands every where do he shall do no damage to his said Masters nor see it done by others but to his power shall let or forthwith give notice to his said Masters of the same he shall not waste the goods of his said Masters nor lend them unlawfully to any, he shall neither buy nor sell without his said Masters license, he shall not play at cards, dice tables or any other unlawful games, he shall not haunt taverns or Ale Houses nor absent himself from the service of his said Masters unlawfully, but in all things as a faithful Apprentice shall behave himself towards his said Masters and all theirs during the said Term. And the said William Wootton for the considerations herein after mentioned doth for himself, his heirs, Executors and Adminstrators covenant promise and agree to and with the said Matthew Robinson Boulton and James Watt Jnr, their Executors and Administrators that the said Thomas Wootton shall well and truly serve them the said Matthew Robinson Boulton and James Watt Jnr and the survivors and survivors of them as such Apprentice as aforesaid during the said term and that the said Thomas Wootton shall well and truly do perform fulfil and keep all and every Article matter and thing by him as such Apprentice to be done performed fulfilled and kept as aforesaid. every week for and during the Fifth Year of the said Term the sum of Twelve shillings weekly and every week. And that they the said Matthew Robinson Boulton and James Watt Jnr will by themselves or their Agents instruct the said Thomas Wootton their said Apprentice in the Art of Moulding and Casting Iron. And for the true performance of all and every the said covenants and agreements either of the said parties bindeth himself to the others of them firmly by these presents. In Witness thereof the parties before named to this Indenture have set their hands and seals the Twelfth day of May in the Fifty Fifth Year of the reign of our Sovereign Lord George the Third by the grace of God of the United Kingdom of Great Britain and Ireland, King defender of the faith and in the year of our Lord One Thousand Eight Hundred and Fifteen. Signed, Sealed and Delivered by the within named Thomas Wootton and William Wootton in the presence of A. Story John Ward." It would appear that Boulton and Watt were large scale manufacturers in Soho,Birmingham, and James Watt Jnr would appear to be the son of the inventor of the Steam engine, James Watt (1736-1819), as history shows Watt Snr approached Matthew Boulton to have his engine manufactured. Thomas was convicted at the 15th Oct, 1823 in the Stafford Quarter Sessions. The records show that Thomas was an iron-caster, 5' 5" tall with brown hair, brown complexion and hazel eyes. He was transported to New South Wales on the 16th March, 1824 aboard the Countess of Harcourt and arrived on the 12th July 1824. In the 1828 Muster, he is listed as being assigned to a Mary Shea in Lower Portland Head in the Hawkesbury area, NSW, Australia. It was while he was in this area that he recieved his Ticket of Leave on 7th May 1830. On the recommendation of the Hawkesbury bench dated 31st October 1829 he was allowed to stay in the Hawkesbury area. At some time during the 1830's he moved to the newly opened area of the Manning Valley. He was granted his Certificate of Freedom on the 8th Jan, 1831. He applied for Permission to Marry on two occasions - 24th Dec 1839 and 21st Jan 1840. He was applying to marry Mary O'Donnell, a convict. It's unknown why two applications were made. They married at St Thomas's, Port Macquarie, NSW on the 2nd April, 1840. Records also show that some time before 1864, Thomas purchased a town allotment at a sale subsequent to the original Taree township sub- division by Henry Flett. On his daughter Mary's baptism certificate Thomas' profession is shown as 'small farmer'. When coupled with his burial in the Taree Estate Private Cemetery reserved for members of the Wynter, Flett and the tenant farmer families, this probably means he was a tenant farmer on the Taree Estate. "The parents who sent their children to the Church of England School, Taree, included Thomas and Christina Bligh, William and Catherine Tisdell, Thomas and Catherine Dyball, Thomas and Mary Wootton, Henry and Mary Flett, Henry and Christina Lyndon, James and Catherine Parker, Ronald and Mary McKay of Purfleet, Donald and Mary McKennan of Purfleet, Murdock and Margaret McLennan of Purfleet, John and Mary Newby of Chatham, Thomas and Catherine Perry of Purfleet and Thomas and Susanna Snowdon of Purfleet.' All of these people were among the first of pioneering families in Taree and adjacent districts. The Church of England School, Taree, provided elementary education for children living at Chatham and Purfleet as well as on the Taree property. Henry Flett as owner of 'Taree', sent his children to the school on his property. In 1851, 1852, and 1853 the girls considerably outnumbered the boys. " "The first actual sale of Taree town allotments took place on 12 December 1854 . At the auction were forty lots sold in the hundred acre township area. Various lanes, streets and roads were included in the subdivision plans and Henry Flett donated land for use for public purposes and for the establishment of churches. Henry Flett had the vision of a well-designed township. He named the streets himself. Victoria and Albert Streets were named after the Queen and her consort who had come to the throne in 1837; Wynter Street was named after Henry Flett's father-in-law who had died while at Port Macquarie on 9 October 1853; Macquarie Street was named after Governor Lachlan Macquarie who had transformed a penal settlement into a thriving colony; and Pulteney Street was named after Pulteney in Henry Flett's own native Wick in county Caithness, Scotland. Henry Flett also named Commerce, Manning and Florence Streets. The sons of William Wynter purchased four allotments in the block bounded by Victoria, Manning and Macquarie Streets which backed on to the river for £89. Other buyers of town allotments at the original sale included George Tilney, William Lavender, Robert Belford, Donald McDonell, John Lowrey, Roger Gofton, William Tisdell, Samuel Plummer, William Plummer, Thomas Findlay, Edward Pearce, Ebenezer Doust, Samuel Ginson, Samuel Whitbread, William Starton, Archibald Cameron, John McLean and John Martin. At subsequent Taree township sales allotments were purchased by John See, Thomas Avery, J. Bernaud, Charles McDonell, H. Edwards, H. Weston, C. Benjamin, John Caldwell, Thomas Bligh, Thomas Dyball, Henry Lyndon, James Parker and Thomas Wootton. All these purchases were made before 1864 ." "MAN DROWNED AT TINONEE - On Thursday evening last, about six o'clock, Thomas Wootton a very old resident of Tinonee, was drowned by falling off the punt, whilst endeavouring to pull it across the river. He had been drinking freely through the afternoon, and ought not to have been allowed to stand on a small platform unprotected by railings, but we have not heard that any effort was made to prevent him from doing so. There were two other persons on the punt at the time, one of whom was Reynolds, the ferry- man; and we are informed Wootton was seen by one or both of them when he rose to the surface once after sinking, but before the small boat was taken round to his assistance he had disappeared, to be seen no more alive. Active search was made for the body, but It was not found till Friday Morning." Mary O'Donnell, born 1818 in County Clare, Ireland; died 05 Sep 1851 in Taree, NSW, Australia. She was convicted of larceny in County Clare, Ireland in Jun 1836. She was transported to New South Wales on the Sir Charles Forbes on the 25 Dec 1837. She was bonded to William Wynter and served him as a housemaid. Mary Ann WOOTTON, born 19 May 1839 in Manning River, NSW, Australia; died 23 Jun 1920 in Mitchell's Island, NSW, Australia; married (1) Antonio Carlo Maddalena 12 Oct 1864 in Wingham House, NSW, Australia; married (2) Charles Owen 11 Oct 1889 in Taree, New South Wales, Australia. William Wootton, born 16 Jun 1840 in Manning River, NSW, Australia; died 14 Dec 1901 in Redfern, NSW, Australia; married Jane Rawson 1862 in Goulburn, NSW, Australia; born 13 Feb 1848 in New York, USA; died 30 Aug 1927 in Randwick, NSW, Australia. Phillip Wootton, born 18 May 1842 in Cundletown, NSW, Australia; died 26 Oct 1921 in Taree, NSW, Australia; married Cecelia Harriet Williams 05 Jul 1864 in Manning River, NSW, Australia; died 02 Mar 1930 in Cheltenham, Vic, Australia. Matilda Wootton, born 18 Sep 1843 in Manning River, NSW, Australia; died 13 Aug 1917; married Thomas Dyball 15 Jan 1863 in Taree, New South Wales, Australia; born 18 Apr 1842 in Taree, NSW, Australia; died 05 Jan 1906 in Manning River, Taree, NSW, Australia. Thomas Wootton, born 09 Dec 1844 in Manning River, NSW, Australia; died 11 Apr 1934; married Fanny Potts 17 Jul 1878 in Manning River, NSW, Australia; born 29 Jan 1860 in Tamworth, NSW, Australia; died 15 Jul 1951. Phyllis Wootton, born 30 Nov 1847 in Taree, NSW, Australia; died 14 Jun 1932 in Petersham, NSW, Australia; married Henry John Buttsworth 15 Mar 1871 in Ghinni Ghinni, NSW, Australia; died 17 May 1918 in Cundletown, NSW, Australia. Harriet Wootton, born 01 Oct 1849 in Manning River, NSW, Australia; died 02 Jul 1919 in Moore Park, NSW, Australia; married (1) James McDonald; married (2) Joseph Pierce Byrnes 12 Mar 1872 in Taree Estate, NSW, Australia.